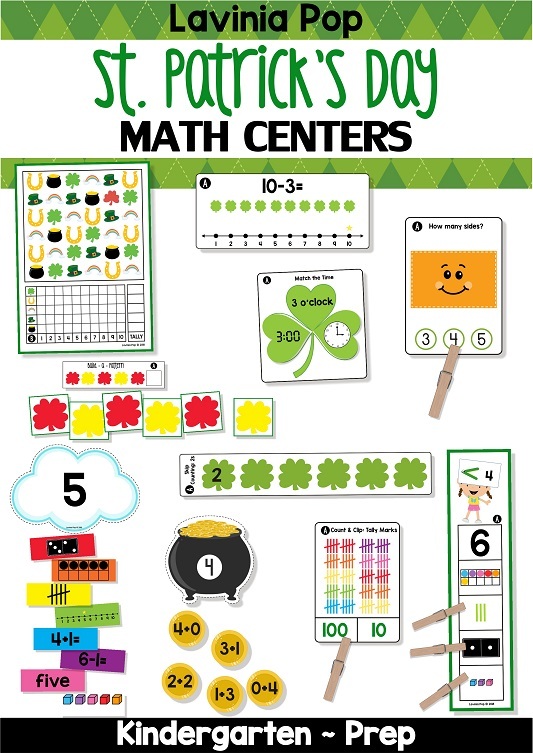 With St. Patrick’s Day literally upon us, I’d thought I’d pop in and show you my new St. Patrick’s Day Math Centers packet. PLEASE NOTE: This blog post contains sample pages from my St. Patrick’s Day Centers for Kindergarten packet. You can download the free sample pages by clicking on the photos. 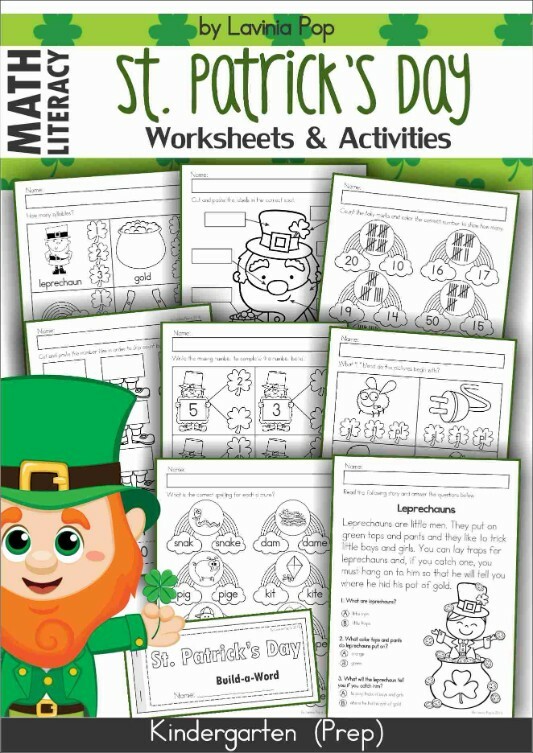 To purchase the complete St. Patrick’s Day Centers for Kindergarten packet, please click here! Print, laminate and cut out the picture cards. The aim of this activity is for children to count the tallies and clip a peg on the correct number to show their answer. Alternatively, children can use dry-erase markers to color the correct number. To prepare the cards for use, print, laminate and cut out all the cards. The aim is for children to match the different number representations on the colored strips to the correct cloud. To prepare this write and wipe activity, print, laminate and cut out all the cards. You may like to make a hole in the top left hand corner of each card and secure all the cards together with a key ring, pipe cleaner or ribbon. The aim is for children to complete the skip counting by 2’s number sequence by writing the missing numbers using a dry-erase marker. To prepare for use, print and laminate all the pages. The aim of this activity is for children to build a pattern following the example from one of the cards. They then need to decide which picture goes in the empty square to complete the pattern. To prepare the activity for use, print, laminate and cut out all the cards. The aim is for children to work out the addition equation and sort the coins to the pot of gold with the matching sum. To prepare the activity for use, print, laminate and cut out all the cards and answer pieces. The aim is for children to work out the subtraction equation using the pictures and number line provided. To prepare this activity for use, print and laminate all the cards. The aim is for children to identify which numbers on the strip show the statement at the top of the card to be true. They clip pegs to show their answers. Print, laminate and cut out the pieces. The aim is for children to identify how many sides each shape has and then to clip a peg to show their answer. Print, laminate and cut out the cards. The aim of this activity is for children to match the digital and analog clocks to the card with the matching time. Can you share with me your activities? I know it will be too much useful to my work with children.